“The Dob is my telescope, I shall not want. It maketh me go out on dark nights; it leadeth me through the Messier objects. It restoreth my night vision; it leadeth me to Star Parties. Yeah, though I walk through the valley of the shadow of large scopes, I will fear no evil for my Naglers and Widefields they comfort me. Thou preparest a star chart before me in the presence of the galaxies. Thou annointest my head and optics with dew; my eyepiece cloudeth up. From Starry, Starry Nights by Tom Clark. I’ve included it here because I thought it was amusing. I’ve owned a variety of telescopes over the years, some were better than others; my first astronomical scope was a 6″ f/8 dobsonian and my current scope is an 18 inch f/4.3 dobsonian. I currently own several other scopes, which are 8″ and 2.6″, plus my 8×42 binoculars, but I use the 18″ most as I’m a deep sky observer and want as much aperture as possible. For more on my scopes, read on. 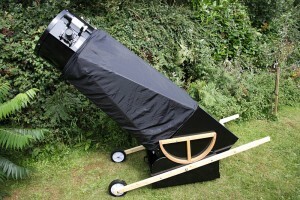 18″ (457mm) f/4.3 Dobsonian – My newest and largest ever scope, made by David Lukehurst of Nottingham, England. 18 inches means a big and heavy scope, which this is, but it is easy to move around with the wheelbarrow handles supplied as an optional extra (they’re an optional extra but are essential). The focal length is 1975mm, which means I don’t need a large ladder to look through the eyepiece at the zenith – a small stepladder or kitchen steps will do. The wheelbarrow handles detach for observing so they aren’t a trip hazard – another reason for removing them is they prevent the scope moving in azimuth when attached. The main mirror is by Nichol Optical of Stockton-on-Tees, England, and is a Suprax low-expansion glass vacuum-coated 1/8 wave 40mm (1.5 inch) thick f/4.3 primary. 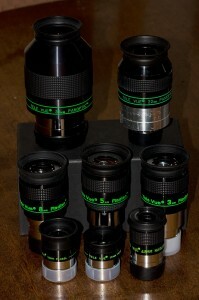 The secondary also comes from Nichol Optical. 35mm Panoptic – Great for wide field views of extended objects such as large nebulae, M31, etc. Only complaint is that the field of view can be very ‘grey’, which is due to the low magnification and not a fault of the eyepiece itself. Otherwise it’s my favourite eyepiece. 22mm Panoptic – Bought second hand from Owen Brazell, this is my finder eyepiece and one of my favourites. 15mm Plossl – Good all-round eyepiece. I use it for viewing smaller objects. I plan to replace it with the equivalent Nagler at some point. 12mm Type 4 Nagler – Bought second hand at the 2012 Texas Star Party. This is going to replace the 11mm Plossl in general use; I’ll keep the 11mm for use with a travel scope. 9mm Type 1 Nagler – Like the 12mm Nagler, this is second hand, bought from Jimi Lowrey, who has replaced it with the equivalent Ethos. This will replace the 8mm Radian. 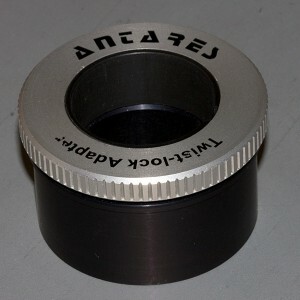 8mm Radian – A good alternative to the 11mm Plossl because of the wider field of view. 5mm Radian – Gives 395x on the 18″ dob. 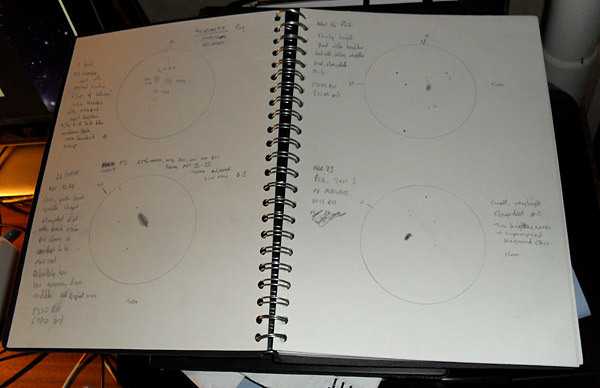 I use it when looking at small, faint galaxies, galaxy groups and small clusters and small planetary nebulae. 3mm Radian – Not often used because the seeing is rarely good enough for such high magnifications (658x on the 18″). 2″ Lumicon UHC filter – Excellent all-round filter for viewing nebulae. Improves the contrast of nebulae. 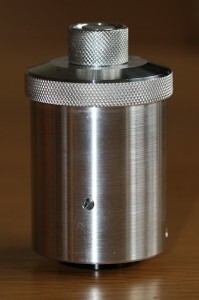 1.25″ Lumicon UHC filter – As above but the 1.25″ version. 1.25″ Lumicon Oxygen III filter – Excellent for planetary nebulae and some bright nebulae. As the name suggests, it allows through doubly ionised Oxygen [OIII], which planetary and diffuse nebulae are rich in, while blocking unwanted emission lines such as streetlights, etc. 1.25″ Lumicon H-Beta filter – This has fairly limited uses, it’s famous for being the ‘Horsehead Nebula Filter’ plus it is useful on some other nebulae such as NGC 1499 (the California Nebula), but otherwise is fairly limited. Here’s a link to a list of uses for the H-Beta, compiled by David Knisely and hosted on Jay Eads‘ blog: David Knisely’s Useful Targets for the H-Beta Filter. This list can also be found on Cloudy Nights forums, in the Deep Sky section (you will need to do a search). Unfortunately, filters don’t work on galaxies, apart from the HII regions within some galaxies, or star clusters, unless the cluster contains nebulosity. Dark Skies Apparel Observing Vest: This is a very useful bit of kit and, since buying one at the 2010 TSP, I can’t do without it. 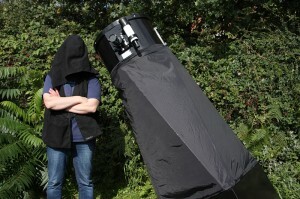 It is a black vest, made from fairly heavy cloth, with large pockets for eyepieces, smaller ones for pens, pencils, filters, etc and, not least, an oversized hood which you can pull over your head keeping out unwanted light when observing those faint galaxies or nebulae. The hood gets you at least half a magnitude deeper if not more. It’s no exaggeration to say that it’s the one bit of miscellaneous observing equipment, beyond scope, eyepieces and finders, I find the most useful. You can find out more at Dark Skies Apparel. Telrad finder: This is a 1x finder which projects three concentric circles against the sky, making it easy to locate objects. A lot of atlases come with an overlay with the Telrad circles printed on it, which makes star hopping easy. You can also print out MegaStar charts with the circles on them. Antares Twist-lock Adapter: This is an alternative to the standard adapter with a retaining screw normally supplied with telescopes. The advantages are that there is no screw to fall out and get lost and the lack of the screw means that eyepieces won’t get scratched. I got mine from Camera Concepts at the 2010 Texas Star Party. Howie Glatter 2″ Barlowed laser collimator (with Barlow attachment), some screwdrivers and Allen wrenches. Dim red torch. TeleGizmos scope cover (TG5D – to cover a 18″-20″ f/4.5 scope). Power supply, dew heaters and dew controller. MegaStar 5 – Very useful software where you can just print off the charts of the area you want. You can zoom in, out and filter the objects by magnitude or catalogue. You can also add overlays with Telrad, finder and eyepiece views. I use this more than normal charts, and a ring binder with MegaStar charts takes up less room on the table than a large atlas. Sky Atlas 2000.0 – Large atlas with fold-out charts and an acetate overlay with to-scale Telrad circles on it. Unfortunately, not all NGC objects are listed. Pocket Sky Atlas – Small atlas that goes easily in a bag. I use it when travelling. Herald-Bobroff AstroAtlas – An excellent atlas by Australians David Herald and Peter Bobroff, this covers both hemispheres and deep sky objects down to 15th magnitude (stars to 14th magnitude) which is more than enough for most amateur observers. It’s extremely hard to get these days, not to mention also now stupidly expensive, and is long out of print, but I was lucky and managed to get a second-hand mint copy. 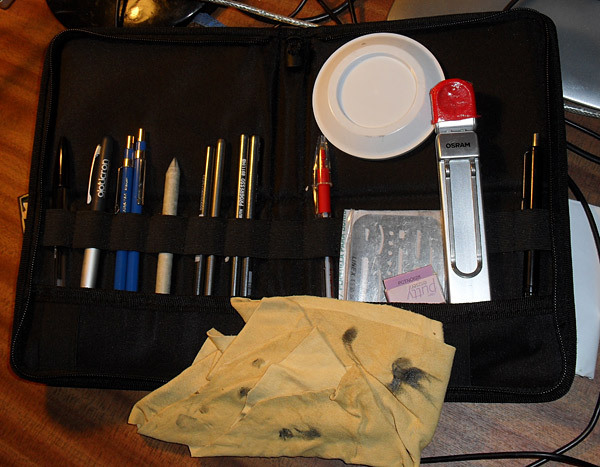 Sketchbook, pen, pencils, eraser, eraser shield, blending stump, chamois leather (also for smudging – works better than stump or finger) and dim red torch. 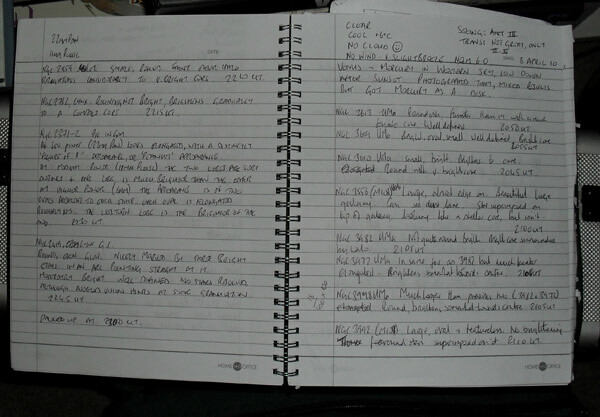 I also use a ruled notebook for those times when I just make notes and don’t bother with sketching. The round white object in the second picture down is a lid off a packet of one-cup filter coffees. The lid is just the right size for an eyepiece view representation circle.